I am currently working on developing a reference architecture for SaaS app built using Rails 5.1 as the API backend and Vue.js 2 in the front-end app. The backend app will use the domain clickplan.biz and the front-end app will be hosted on clickplan.net using Cloudfront CDN. For now, only requests from clickplan.net will be allowed to clickplan.biz. The backend app will be deployed on Elastic Beanstalk. The front-end app will use WAF (web application firewall) in front of the Cloudfront CDN. 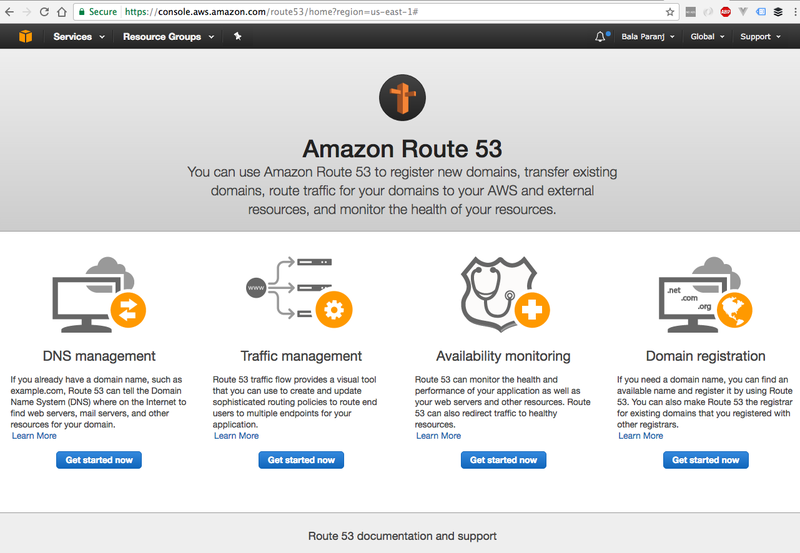 In this article, we will discuss the basics of Amazon Route 53. In the upcoming articles, I will discuss how I deploy my front-end and backend apps on AWS services. I got tired of writing infrastructure related code and also wanted to minimize time spent on admin tasks such as installing, configuring and upgrading software on the server. If I can focus on my core application logic and save time in server maintenance, I will have time to spend on tasks that generates revenue for the SaaS app. You can now search for available domain in the search box. You can change the number of years to register your domain during checkout. The advantage of registering a domain with Amazon is that they will automatically create a hosted zone for you. This step must be done by you when you register your domain somewhere else. After purchase is complete, you will see the confirmation screen. 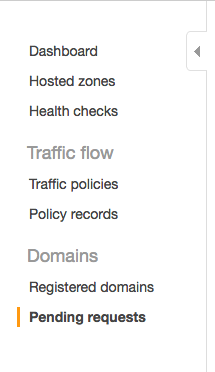 Click on Go to Domains button to see the status. It will take some time for the domain registration to complete. It will be in the Pending requests. It will take a few hours to complete the registration. You will see your domain in the Registered Domains section. Step 2 : Create a hosted zone. This is automatically done for you by Amazon if you register your domain on Amazon. Otherwise, you have to do this step. 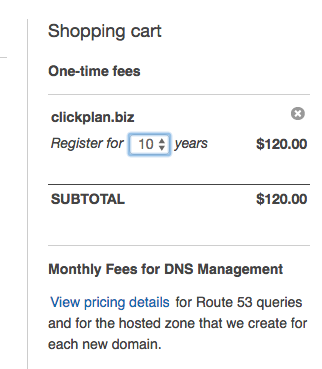 I registered my clickplan.net domain on namecheap. So I will update this article when I create the hosted zone for the front-end app. You can see bigger screenshots of the images above here.